Because my one-year-old niece was sick over Memorial Day Weekend, we postponed our trip to my brother's house in suburban Washington, D.C. until this past weekend. On the way down I-95, we stopped in Baltimore for lunch at the always consistent Austin Grill, a regional Tex-Mex restaurant with an extensive gluten-free menu. (The chain has five locations in Maryland, four in Virginia, and one in D.C. proper at Penn Quarter.) Our older son ordered the chicken fajita entree, which came with char-grilled chicken, three corn tortillas and sides of black beans and cilantro rice. The complimentary tortilla chips and salsa are gluten free as well. Highway traffic was surprisingly light, and we made it down to Montgomery County, Maryland mid-afternoon. We stopped by my brother's house to say hello before checking into our hotel for the weekend. From there, we met one of my wife's college roommates and her family at Red Robin Gourmet Burgers in Gaithersburg, Maryland. We brought with us a couple of Schar rolls (our son's favorite), so we used one for the cheeseburger he ordered. Our server told us that the "bottomless" french fries at that location were cooked in a dedicated fryer but that they would have to be served without seasoning to remain gluten free. The boys take turns staying over my brother's house since we usually stay for two nights, and so on Friday night our older son stayed at the hotel with me and my wife. On Saturday morning, the three of us went to Rockville, Maryland outpost of The Original Pancake House. (The restaurant is part of a chain that operates in about 100 locations throughout the United States.) Our son ordered a short stack of gluten-free pancakes - cooked on a cleaned, separate area of the grill - along with scrambled eggs, bacon and shredded potatoes. In addition to its tasty pancakes, the restaurant is also known for its gigantic fluffy omelets. I don't believe all locations have gluten-free pancakes just yet, so call ahead if your travel plans take you to an area where there's an Original Pancake House nearby. In the D.C. area, there are locations in Bethesda, Maryland and Falls Church, Virginia, both of which offer gluten-free pancakes. On Independence Day, we met up with my brother and his family and drove out to Great Falls Park in Virginia. At the Park, visitors can see the remains of the Patowmack Canal, which was used to ship goods on flatboats that traveled from Cumberland, Maryland to Georgetown in the early 1800s. 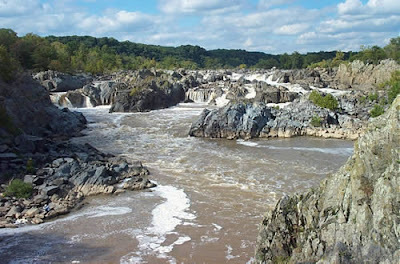 The highlight of the Park is the Great Falls, where the Potomac River cascades over a series of rocks and falls into Mather Gorge. (Photo courtesy of the National Park Service.) The more adventurous can rock-climb and hike throughout the Park. We walked the trail along the falls and took in the magnificent view from three observation points. For dinner, we brought in pizza from zpizza, a Southern California-based chain that offers pizzas made with organic ingredients, low-fat cheese and preservative-free toppings. Many locations, including the one we went to in Rockville, carry gluten-free pizza (call ahead or check the company's website to confirm). The gluten-free pizza is prepared away from the other pizzas and the staff is trained to use specially designated ingredients and utensils. Although all of the pizzas are baked in the same brick oven, the GF pizza placed in a pan first to avoid cross-contamination. There are a bunch of zpizza locations in suburban Washington. D.C.
Before we hit the road on Sunday, we stopped at the local outpost of Noodles & Co., where both boys ordered pad thai noodles. The pad thai is the only dish that is gluten free, and the beef and shrimp are the only proteins that are safe. The chain has lots of locations along the I-95 corridor in Maryland and Virginia. The safe options here are limited, but if you enjoy pad thai this fast-casual restaurant is worth seeking out. While we didn't need to shop for groceries on this trip, MOM's Organic Market has a wide selection of gluten-free foods and beer. MOM's has four stores in Maryland and one in Virginia. If you ate at zPizza without getting sick, congratulations! The supposedly GF pizza we had at one here in California made us sicker than anything else in the 5 years we've been GF. It was one of my son's favorite memories of DC.